This one, which came out for the 2015 Winter Hello! Cons, would be Berryz' last as well as Country Girls' first. It also pre-dates Kobushi Factory, who were announced at that Hello! Con itself. Thus, the usual questionnaires are supplemented with a Berryz Kobo Last Maruwakari special as well as a new faces special (MM 12ki, S/mileage 3ki, the 5 new Country Girls). This questions come from the Berryz Kobo Last Maruwakari special, where we get one last, deep insight into the girls before their hiatus. Q1. BEST 3: Favourite Berryz Kobo songs! I like the lyrics to this song!! It's the coupling song for 'Suppecial Generatio~n', but compared to back then, I think it's even better when I listen to it now. It's a song that touches my heart so much that singing it makes me feel like crying. It's a song that I hope everyone comes to like. I like the lyrics of the chorus in particular! ♪ My rival is my own weak self, who looks at the past..... That's definitely how it is!! There are way too much...... but it'd have to be our own concert at the Saitama Super Arena where we attained the record of being the youngest performers there. It was this huge stage of our dreams, and even though we were still young, I still remember getting a shock!! Tsugunaga Momoko: This doesn't mean that we're the best of friends (laughs), but I feel that when it comes to how we feel and think about work, we're the same. In various ways, I can rely on her. Tokunaga Chinami: When we were in primary school, our parents would drop us off and pick us up, but almost every time, Chii, Chii-mama, myself, and mother Shimizu, the 4 of us would go for a meal after work ended. Chinami was one who helped me overcome the foods I didn't like. 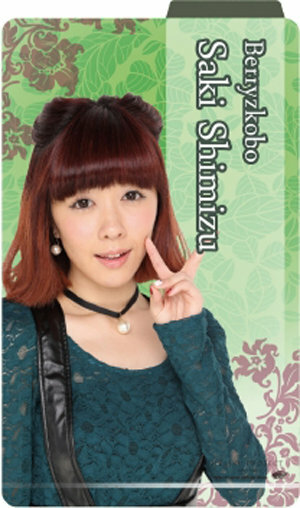 Natsuyaki Miyabi: She's my constant consulting partner! Miya was the person who brought an end to the time when I was thinking about quitting work. I have nothing but gratitude towards her. I don't think that there's any group who does as much as they please besides Berryz Kobo. Even though it doesn't mean that the members are close-knit, but we feel the bonds, having been together for over 10 years with the same members. I think that we were able to go this far because of everyone, I think of it as something to be proud of!